Businesses are constantly searching for new ways to acquire new customers while also keeping costs down. Unfortunately, these two goals usually have an inverse relationship: It's difficult to acquire more customers without spending more money. With customers becoming savvier, and thus skeptical of traditional marketing tactics, this becomes an even bigger challenge. Consumers like to know what value they're getting before making a purchase decision, so it takes a lot of educating and relationship building in order to convince leads to make a purchase. This is usually done through expensive advertising, sales demos, and other marketing campaigns. 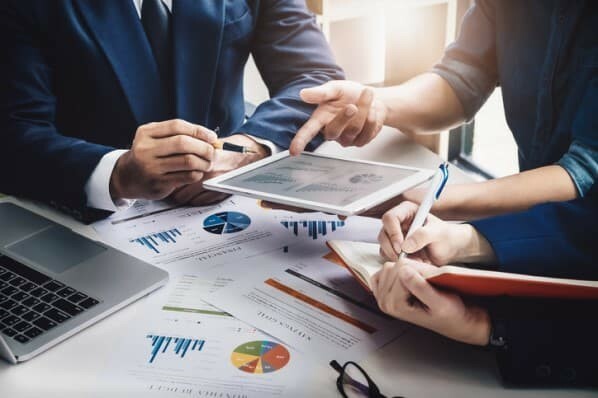 However, using a freemium acquisition model can reduce the cost required to acquire new customers by shifting the education burden from your sales and marketing teams to the customer. Freemium is a two-tiered user acquisition model that splits users into either a free tier or a premium tier depending on whether or not they pay for an account. Free tier users have limited access to certain product features as a trade-off for not paying. Premium tier users gain greater access to features, but they must pay for their account. The main goal of using a freemium acquisition model is to decrease the customer acquisition cost (CAC) for your business. By eliminating the cost to sign up for an account, you're effectively lowering the bar to entry for new users starting to use your product. This makes it possible to avoid traditional overspending on paid marketing channels and convoluted sales processes to focus more on building trust and highlighting the value of your product to free tier users through actual usage. The freemium model creates a natural lead nurturing process. It gives your users the opportunity to discover your product without having to interact with marketing campaigns or salespeople. After achieving success with your product, free tier users will eventually reach the limits of the free-level account and decide to invest in a premium account in order to gain access to the full set of features and value that your product provides. By limiting access or usage in your product, you create friction for free users, which encourages them to upgrade to your premium tier. Usually, businesses will use several of these limitations together to amplify this effect even more, so feel free to get creative. The most important thing is that the limitations will leave them wanting more, but not so much that they don't still see the core value of your product. You have to find the right balance, which requires a deep understanding of your customer's needs and the value they get from your product. Now that you know what freemium is and how it works, let's take a look at a few examples of how the freemium model is used in B2B and B2C companies. B2B products are created to solve complicated business issues for large organizations at great scale. That means they're usually feature-rich and come with a steep price tag. So, when B2B companies implement a freemium acquisition model, it involves a more convoluted system of limitations. Users need more incentive to upgrade because of the complexity and high price associated with the product. 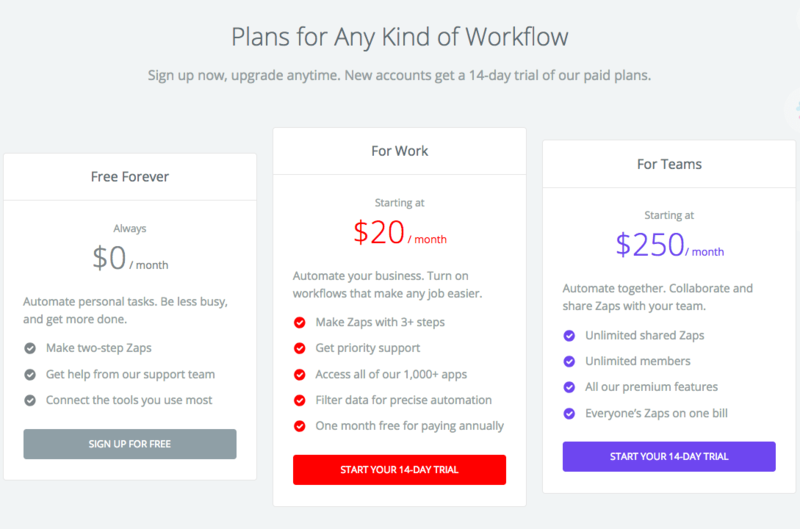 To illustrate, let's take a look at a B2B freemium example in action: Zapier. 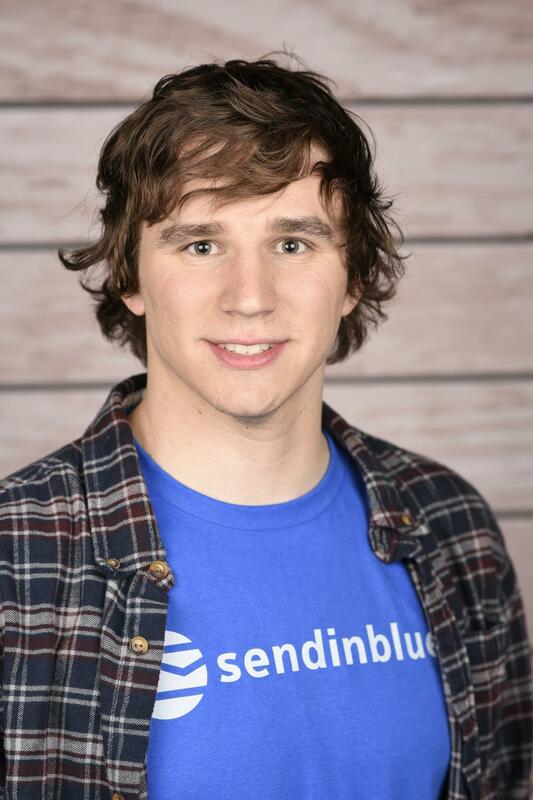 Zapier is a web application that allows users to connect different digital tools together through sequences of automated triggers called "Zaps." To boost account creations and give tentative users just a small taste of what the product is capable of, Zapier uses a freemium model that leverages all of the different types of limitations that you can place on a freemium product. When a new user signs up, they're only able to create five single-step Zaps at any given time. That means there can only be an initial trigger (e.g. a survey is submitted on Google Forms), and a subsequent task (that survey data is transferred to your email contact database). However, after upgrading to paid tiers, Zapier gives them access to the enhanced feature of multi-step Zaps, allowing for more complex automation. This is a great strategy because the single-step Zap is a perfect way to give users a taste of how powerful the product is, while still leaving them wanting more. They also have gated app integrations (known as "Premium Apps") that are only available to premium users. So, if users want to build Zaps to connect with tools like PayPal, Magento, or Facebook ads platform, they'll need to upgrade to one of the premium tiers. These premium tools are very common, so there is a good chance that most of their users will want to use one of their premium connectors -- ultimately forcing them to upgrade. Number of Zaps and task completions: You already know what Zaps are, and tasks occur anytime that a Zap transfers data between two applications. Free users just starting out on the platform are only afforded 100 monthly task completions spread out across their five Zaps. These numbers increase to 20 Zaps and 1000 monthly tasks once users enter the first premium paid tier, and continues to grow to unlimited Zaps and 50,000 monthly tasks at the highest tier. Syncing interval: Time interval at which the Zap checks for new data. The syncing interval starts at every 15 minutes, but decreases to every five minutes for users in the second premium paid tier. Number of users: How many people can log in and work from an account. For large organizations, Zapier encourages upgrades to the highest premium tier by providing collaborative tools such as shared folders and multi-user login. Usage limitations like these are an extremely effective tool for boosting paid user acquisition. It all goes back to the same idea of showing the user what you can do with your product, but ultimately leaving them wanting more. This is an excellent example of how complex and expensive freemium products can take a very targeted and comprehensive approach to boost revenue by encouraging free users to upgrade to premium. Whereas B2B products often require complex freemium strategies with multiple layers of limitations to create friction and increase conversions to premium, B2C products are able to take a simpler approach to freemium. The largest group of B2C products that benefit from the use of a freemium acquisition model are mobile or web apps. To get a feel for how this looks in practice, we can take a look at Spotify's acquisition strategy. For those not familiar, Spotify is an app for consumers to stream their favorite music from their phone or computer. The app also lets users save music, create and share playlists, and discover new music. To get people hooked, Spotify implements a simplified version of the freemium acquisition model we've been discussing throughout this article. 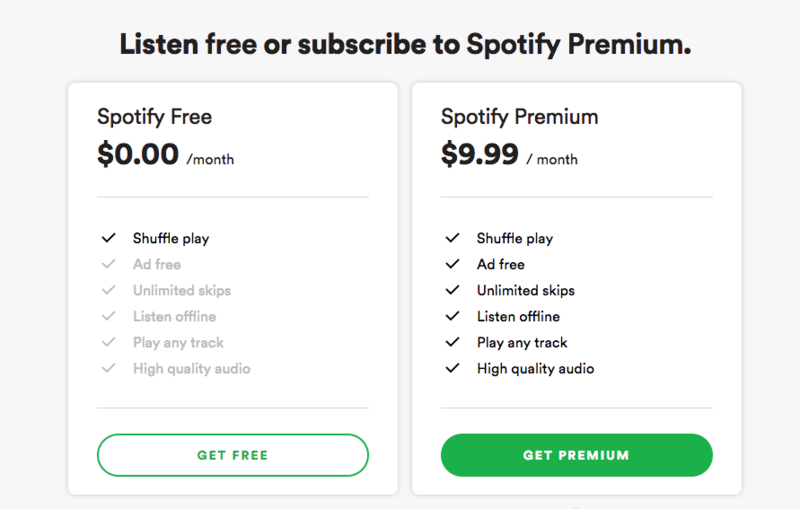 Although B2C products like Spotify tend to be simpler than their B2B counterparts, there are still plenty of ways to limit features and encourage upgrades from free to premium. In the case of Spotify, the free plan lets users stream most albums, playlists, or curated radio stations on shuffle play, but they are served ads in between songs and users can't skip to specific songs they like. Spotify Connect, which allows users to connect Spotify to other devices like TVs, smart speakers, etc. As you can see, the feature limitations that Spotify uses are pretty heavy. But, free users still see a lot of the value of the product through the limited features. Still, things like the inability to switch to a specific song on a playlist when listening constantly remind users of what they're missing out on by not going premium. In addition to feature limitations, Spotify also has a few limitations that they place on product usage as well. Users in the free tier are only allotted four song skips every hour. This restriction is completely eliminated after upgrading to premium, allowing users to skip as many songs as they wish. This can be a very frustrating aspect for people looking to discover new music on the platform, which is one of the main draws of the product. Coupling this limitation with the fact that free users can only listen to playlists on shuffle adds up to a powerful incentive for any picky music listeners out there. Finally, as mentioned earlier, free users are served ads in between songs. Once they upgrade to Premium, however, music is completely ad-free. I think that alone is incentive enough for most people! You can see that the overall approach is rather simple compared to the B2B example, but the base concept is the same. Free users get a taste for the value of the product through the limited features, but the limitations create enough friction that anyone looking to become more than just a casual user will likely upgrade to remove the limitations. TuneIn is a freemium B2C app that lets users stream radio, podcasts, and live event broadcasts on a variety of different devices, such as their TV, computer, tablet, or phone. The biggest feature limitation between TuneIn Premium and Free is free users can't listen to live sports games. This could be a particularly compelling way to activate free users because the value proposition of TuneIn is its ease of listening across devices. 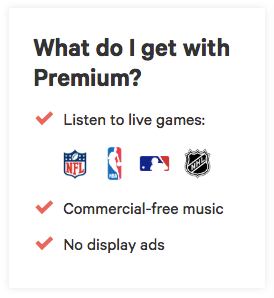 Presumably, if a person is that eager to listen to the radio, podcasts, music, and sports games in a way that's easier for them, they might also prefer access to live games -- as is offered for free by tuning into radio stations in your car. Additionally, TuneIn limits usage to encourage free users to start paying for the premium version by making users view display ads and listen to commercials in between songs, episodes, or broadcasts. 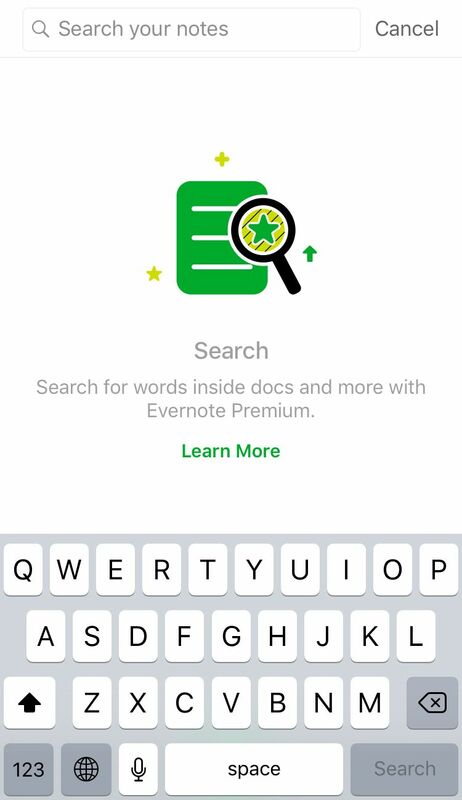 Evernote is a note-taking and organizing app that allows users to jot down notes in different "notebooks" across different devices for note-taking and writing on-the-go. Evernote Basic's features are fairly limited for users who want anything beyond the basic functionalities of a virtual notebook. Evernote Basic users can only get customer support through self-serve online forums, and they don't have access to collaborative notebooks or the ability to work offline in Evernote, among many other paid features. Evernote Basic only allows users to sync notes across two devices, vs. the Premium and Business tiers that allow for syncing across an unlimited number of devices. 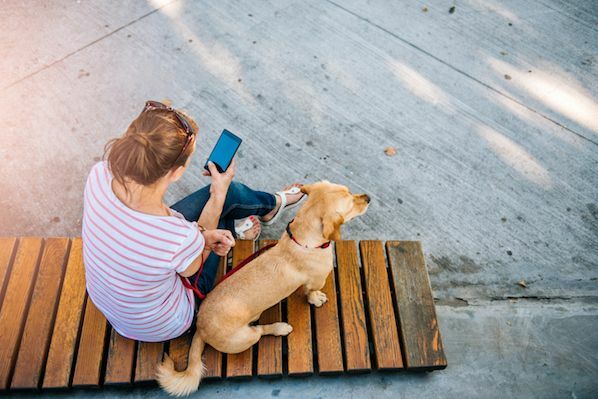 In our increasingly connected world, this difference can have a huge impact on someone's workflow and their ability to record notes across different devices and media. 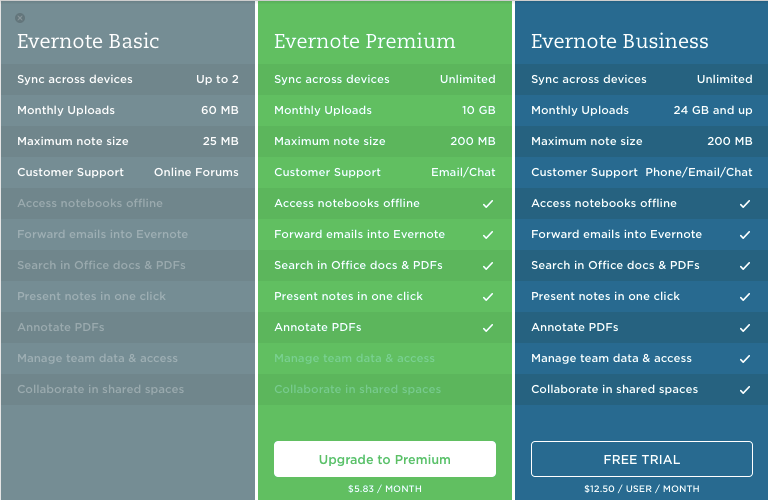 Evernote Basic also limits the maximum size of notes, the maximum amount of monthly uploads into Evernote. Now that you've learned what freemium means, as well as how it looks in practice, you might be wondering, "why not just use a free trial?" This is a question that many businesses end up asking themselves, and the right answer may be different depending on the specific goals, target audience, and product type of a given company. With a freemium system, the free plan lasts forever, whereas free trials are only for a limited time (e.g. one week). 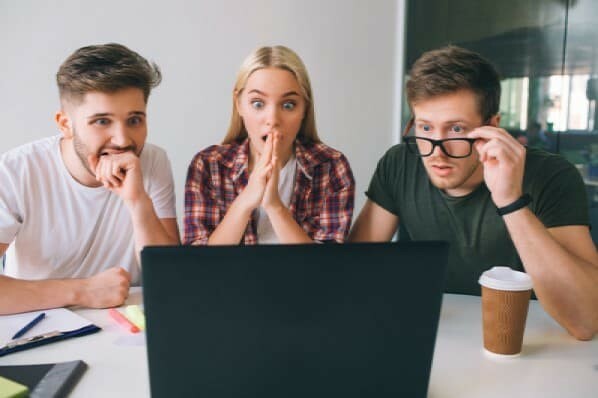 Free trials give users complete access to all (or most) of a product's features, whereas free users of a freemium product only have limited access to features within a product. These differences produce unique benefits and drawbacks for each system. One of the most obvious benefits of using a free trial is that you don't have to support casual users who never generate any direct revenue for your business. Once the free trial is over, users must either sign up for a paid account or churn. This leads to a higher product engagement rate because you're only left with paying users, and these users will be more likely to seek out and extract all the value that they can from your product since they're not getting it for free. A higher product engagement rate can lead to a longer customer lifetime, which translates into more revenue over time. In addition to that, free trials are generally much more effective at converting users into paying clients -- especially when a credit card is required to sign up for the free trial. Whereas freemium to paying conversion rates generally hover somewhere between 2-5%, free trial products that require credit cards are close to 30% or higher. This is likely a result of users getting the full functionality of the platform (rather than the limited access that freemium provides) through the free trial access, as well as the fact that free trials requiring credit cards will bring in much more qualified, albeit fewer leads. While there is some crossover in the goals and method of using freemium versus free trials, freemium tends to be the option that is easier on the customer. Free trials create a lot of pressure up front because they typically require a credit card to sign up, and the free period is only for a limited time, after which the user must make a decision. Freemium, on the other hand, creates a pressure-free environment for new users to explore your product without being forced to make a purchase decision before they're ready. Freemium also allows your solution to scale in parallel with your users' needs. A customer may not require all of your functionality when they first sign up, but as they grow, their needs may evolve as well. This makes it easy for your product to become integrated into your users' normal workflow, making the limits that you've placed on your free-level plan more effective because it is much more painful to switch to something else. This benefit is perfectly illustrated by Dropbox's freemium strategy. They start by giving users two GB of free storage, and as users see the value and start adding more and more files to their Dropbox account, it becomes their new norm for storing and sharing electronic files. When users finally reach the 2 GB storage limit, it's will have become very hard to switch to a new solution and move all of these files somewhere else, so the user ends up paying for more storage instead. The other big benefit of using a freemium model compared to a free trial system is that freemium products are more shareable than free trial products. One of the best ways to grow a product quickly with very little cost is to leverage word of mouth from current users, and freemium makes this very easy. The reason for this is that the freemium acquisition model brings in a higher volume of "leads," which gives you more opportunity to reach a wider audience through word of mouth. So, even if your free users are not directly bringing in revenue for your business, they could still be helping you grow by referring your product to others in their network. Over time, this can generate more revenue and acquisition potential for your business than a free trial system because the sheer volume and scale of your target audience are larger, even if the conversion rate from freemium to paying is lower. Free to play is a subset of freemium businesses that sell video games. "Free to play" refers to video games that users don't need to pay for in order to start playing and get full access to game content, but users have to "pay" to continue playing the game by either viewing display ads, referring friends to play, or completing quests. Because the ultimate goal of using a freemium acquisition model is to increase the number of paid subscribers, the success of your freemium model can be assessed by looking at the freemium conversion rate, or the rate at which people upgrade from a free-level plan to a paying plan. As mentioned earlier, freemium conversion rates generally fall somewhere between 2-5% on average. But, there are steps you can take to improve this number and get the most out of your freemium model. 1. Set the right product limitations for your free account. If your freemium conversion rate is too low, one of the first places you should look is your free plan. Is it too comprehensive? If users are able to get all of the value that they need from your free plan, there is obviously no incentive for them to upgrade to a paid account. You can use your competitors as a gauge to see how much you should be including in your free plan. Of course, you don't have to (and probably shouldn't) match them, but you should have a good understanding of what the competitive landscape is so that you can craft the right argument in your marketing messaging as well. You should also look at your product usage data to develop a better understanding of how customers use your product and where they are getting the most value. This knowledge will help you decide which adjustments you can make to move the needle on your freemium conversion rate. You just need to make sure that you're leaving enough of a value gap to create friction for free users in order to encourage more upgrades. 2. Include a full-feature free trial. While I discussed the differences and benefits of using a free trial system versus a freemium system, but luckily, you don't have to choose between the two. Get the best of both worlds by offering new users a full-featured free trial while still offering a limited free-forever plan at the end. 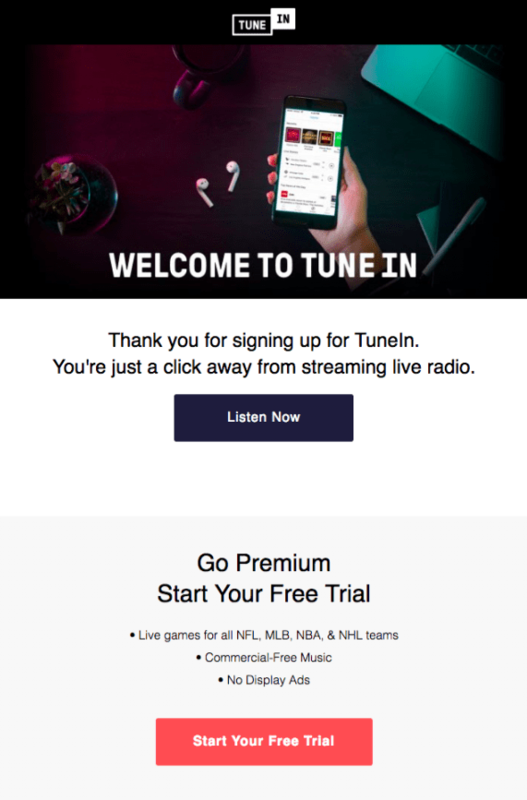 You can see in the example above, TuneIn Radio offers free users a free trial for their Premium tier so that customers can experience the full functionality of the app. Taking a combined approach like this can be very effective because the two strategies actually complement each other very well. Offering a free trial lets new users explore the full functionality of your product with no limitations. They're able to see the full value before making a purchase. Additionally, once the free trial is up, users aren't forced to make a purchase decision if they're not ready -- they can continue using the free-level plan, which reduces free trial churn. Moving to a free-level plan after having full access during the free trial will also make the limitations on the free plan much more pronounced, which creates a deeper psychological incentive to upgrade back to an account with fewer limitations. 3. Focus on customer success. With freemium, you're letting your product do the selling for you. That means it's absolutely essential that your free users are able to quickly and easily discover the value of your product right when they sign up. The best way to facilitate this is to optimize for customer success. Set customers up for success with a good welcome email or onboarding email series. Whatever you do, make sure that you're helping customers get more value out of your product. This can significantly increase the likelihood that free users will upgrade to a paid account. 4. Remind users to upgrade at every turn. Using these tactics can help convince free users who are on the fence take the final step and convert into a paid account. You can even take the last option a step further by tracking user behavior and using email segmentation to send a more targeted upgrade message according to which limitations affect them most or to users who are very close to the usage limitations you've placed on the free plans. 5. Take a more hands-on approach to inside sales. While this tip doesn't really make sense for B2C products that tend to be less complex, creating an inside sales team can be another excellent way to get more out of a freemium acquisition model and increase freemium conversion rate for enterprise-level B2B products. Based on usage patterns: Implement a lead scoring model that tracks your users' behavior. Users who are close to the limits of your free plan or users who take advantage of many different features within your product will receive more points. Once a lead reaches a certain score, you can further qualify them with an automated process to gauge interest in upgrading, as well as revenue potential. From there, you can decide at what point your inside sales team should intervene. Based on third-party data: Enrich the data in your CRM with third party data to better understand who your high-revenue-potential users are. For example, you can look for potential enterprise leads who might be using your product in a tangential way (e.g. a regional sales office using your tool at a massive multinational organization). 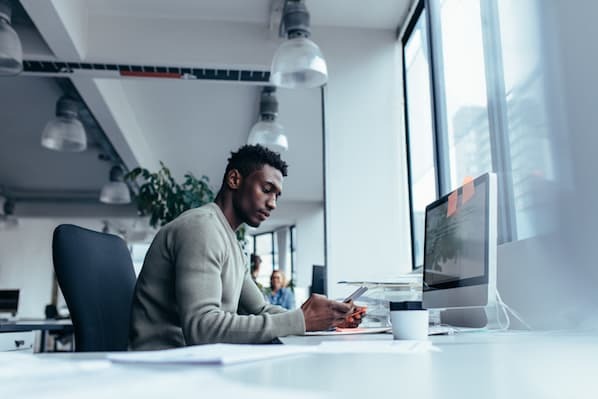 Once you have your qualified leads, your inside sales representatives can follow up to get in contact with the decision makers and make the sale directly. This guide should have hopefully given you a better idea of how freemium can be helpful in increasing the acquisition potential of your product and rapidly growing your business while keeping your acquisition costs down. You just have to make sure that you always focus on your customers and understand how they get value from your product. This will allow you to create a freemium model that strikes the perfect balance between demonstrating the utility of your product while still leaving free users wanting more. To learn more, read about the different stages of the SaaS customer lifecycle next.